Not much change from the beta. This game is not even remotely like the first Dark Strokes game. I am having a hard time imagining any excuse for releasing it under this series title. It is nevertheless a well-made and enjoyable game, which at least is that much it has in common with the first game. The opening is excellent; exciting, intriguing, and the graphics are fantastic. This is a somewhat dark fantasy, with enough of the unusual about it to make it stand out among lesser games. The graphics are great. Clear and detailed, with strong colours and excellent artwork. It is fairly dark for much of the demo, perhaps a little too much so for some. The animated cut-scenes are a delight, and the little touches are fun. Clicking around at anything interesting provided me with lots of gratuitous fun, as owls turned their heads, butterflies flew away, and rabbits escaped down their holes. The story is told in many ways – shadow plays, scrolls, and mini-games, all of which adds variety to the visual experience. The sounds are a bit loud, but after lowering them, the music was very relaxing and pleasant. I would have enjoyed more ambient sounds. The voiceovers vary. The narrator’s voice is wonderful. The girl’s I could really live without, and I am of two minds about the heavy Southern US (?) accent of one of the other characters. You are a forester who rescues a beautiful young maiden from a seriously scary attacker with unknown intent, but black magic at his finger tips. She stays with you, brightening your life, until a hot air balloon drops a gift on the porch. Upon opening, the package freezes absolutely everything in your cabin, and assaults your girl – I’ll leave you to find out the results of that. In any case, it is clear you must follow the balloon to the city to find out how to undo what has been done, and to discover the mystery of the young girl’s past. The gameplay is a little different than your standard HOPA. Although it is primarily puzzles and HOPs, both of them are unusual in style. The 3 HOPs in the demo are an interactive search for pieces of an item you must assemble, a multiples of (musical instruments), again interactive, and a more traditional interactive word list. The mini-games/puzzles are unusual too. They include more than one panorama-style game, each of a different nature, and a game in which you must choose the right path, on the go, to avoid obstacles. Another is one where you choose the way, hoping to avoid unseen obstacles. Many involve small amounts of easy assembly or construction work. As well, items in inventory can be combined, or changed by extra clicks. Sometimes they have other items inside them. The hint is directional. The interactive jump map indicates where actions are available, and you can choose from 3 difficulty levels. There is a shadow box that stays above hint and gives back story when the slides for it are found. And there are potions that stay with us and grant special powers. There is a helper, and it is cute, also very useful. As well, there is a fair amount of interaction with other animals along the way. I really had a hard time with the other 'help' we got from the girl we saved - her inane assistance was driving me batty! It all fits into this story, but seems strange to have so much cute in a Dark Strokes game. Many who enjoyed the first game will probably be very disappointed with this one. 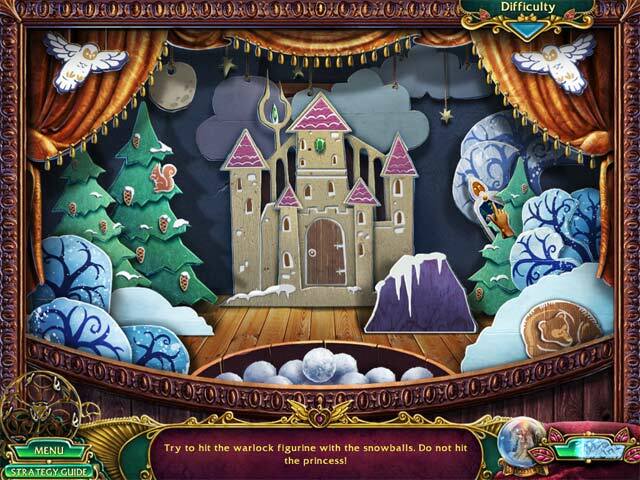 Achievements and collectibles – 12 scrolls, 35 dreadfully easy to see snowflakes, and 10 ‘magic’ (morphing and hard to see) items found in the HOPs. The achievements are displayed with the pet in its room. There are both story and performance achievements. The demo covers the first 3 of 10 chapters, and the bonus play is a further 3 chapters. The strategy guide is pictorial only. I have never tried to use one like this, and I am intrigued about discovering how useful it really is. The gallery has the usual wallpapers, concept art, music, videos, and character dossiers. There are also replayable “mini-games” and “puzzles”. Seeing I couldn’t get a look at any of these extras without buying, I cannot tell you whether HOPs fall into either of these categories, or how many there is of anything. This is a fine game, and I really enjoyed playing it – for what it is. 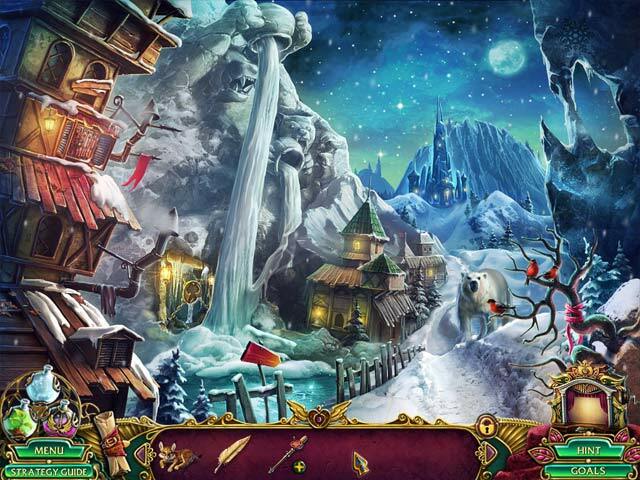 Which is a darkish fantasy game with some unusual touches. Linking it with the first Dark Strokes, though, seems almost like false advertising. Options include separate sliders for Music and SFX, Fullscreen, Custom Cursor, Widescreen and Low-quality. There are three difficulty levels, from Casual to Hard. Wonder of wonders, our protagonist is a male for once! The story combines several fairy tales into one unique story, and throws a bit of clockwork-steampunk into the mix! There are 35 locations to visit, each hiding a collectible snowflake. Be on the lookout for 12 magic scrolls during your journey, as well. The gameplay is a bit repetitive, and some of the actions are so simplistic that I hesitate to call them puzzles. Something that I really appreciate is that you can change the difficulty of the actual puzzles with a click using the drop-down box at the top right of the screen. There's an achievement for completing every puzzle on Hard, but you may be able to obtain that one via replaying them in the Bonus area (I didn't try). 6 Pages of "Trivia" (Fun tidbits about the game) Must find every snowflake to unlock this content! The bonus is HO-heavy. 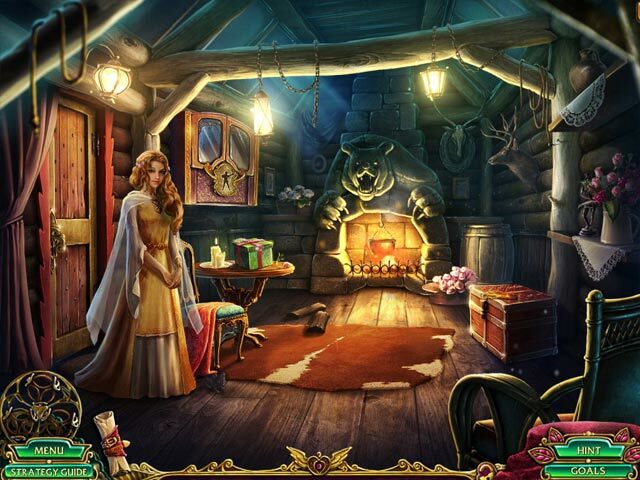 It seems like we spend more time finding hidden objects than we do pursuing the story. There are also two reiterations of mini-games that we already played in the main game. It was a decent length... Longer than I had expected it to be. There are no collectibles to find in this part of the game. This chapter is absolutely necessary to complete the story. Sure, the main game ended in a satisfactory way, but this bonus chapter ties up some loose ends AND gives us some great background information in the process. This is a very pretty game that was fun and interesting enough that I played it through twice back-to-back. I missed two snowflakes on my first run *grumble grumble*, so I played it again on Hard. FUN FACT: The Strategy Guide has a section that shows you where every snowflake is located. *face palm* FYI, only the first three are missable, as the other 32 locations stay open to you throughout the game. The narrator says that it's "the very same night", but the hunter - our protagonist - talks like they've been living together for weeks, at least! The music is quite beautiful, and the characters and story kept me playing for longer periods than I'd normally spend on a HOG. Although this title can a bit repetitive, the combination of story, graphics and heavy adventure-esque gameplay kept me interested enough to want to finish the game (twice) in a day. Definitely recommended despite some minor flaws!